Ready to set up an account or have a question about your current account with us? Please contact us today with any questions you may have. Give us a call, send us an email, or fill out the form below to get in touch. 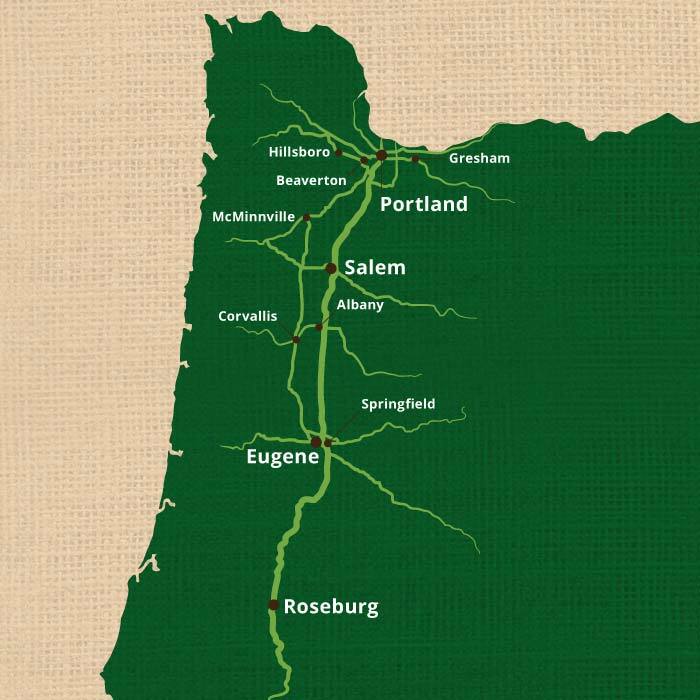 South Fork’s professional route drivers deliver to customers in major cities along Oregon’s I-5 corridor, including the Portland and surrounding metro area, Salem, Albany, Corvallis, Eugene, Springfield, and Roseburg. South Fork uses the Advantage Route Systems Route Manager to keep up-to-date inventory of our customer’s products on hand. With every delivery, the driver prints and provides an accurate invoice of items delivered. The driver also organizes and stores new products directly into your cabinets, cleans your brewing equipment and water filtration system, exchanges any malfunctioning equipment, and leaves your reception, conference, or break room area in pristine condition. If you live in a city or area not listed above, please give us a call to see how we can service your location. Please note: Residential delivery available for Lane County residents, only. Sign up for e-news to have news and special offers sent to you.